It has to be one of the world's most perfect spots for a Valentine's Day Lunch. Here's the scenario. You take a seaplane to an isolated restaurant in the middle of unspoiled bush. The sun is sparkling on the water; the sky is blue and all around is nothing but quiet.. Even the champagne arrives by boat. Of course you can drive to Berowra Waters Inn, a Sydney secret on the edge of the Hawkesbury River. Less than an hour will get you from the centre of the CBD to the area then it is a hop on a wooden ferry or private boat for the last leg. But a seaplane is so much more romantic. Most Sydneysiders have heard of Berowra Waters Inn (some of Australia's best chefs have owned and operated the unique venue) but surprisingly few have actually been. For those coming from interstate and overseas the restaurant and its surroundings are yet more proof of how extraordinarily beautiful Sydney's scenery can be. Owner/chef Brian Geraghty took over at Berowra 15 months ago and has created a 4 or 7 course degustation menu for diners to graze their way through 'a story of flavours'. And what a story, each chapter is better than the last: crab and fois gras, melt-in-your-mouth ocean trout, an explosion of flavour and colour with beetroot, goats cheese and licorice. The taste sensations just keep coming. Lovers can linger for hours over the fabulous food, gazing into each other's eyes or out at the meandering river. Geraghty started his career in the kitchen at the age of 14 and has worked alongside some of the most influential chefs around, including Sean Conolly at Astral Restaurant, Shane Osborn at two Michelin star Pied a Terre in London, and Peter Gilmore at Quay. Berowra isn't just about lunch, it's an all day experience lulled by the water and the wine diners tend to relax here all afternoon. The fact that Sommelier Victoria is so good at choosing wines to compliment each course makes it even harder to leave. 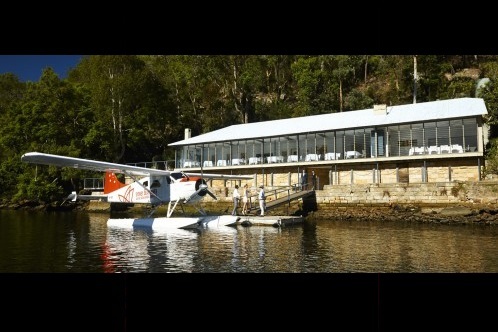 If you have booked a seaplane the return journey to Rose Bay takes you across a green carpet of unspoiled bush land . the National Park and the golden ribbon of Sydney's Northern Beaches, culminating with views of the Opera House and Harbour Bridge.